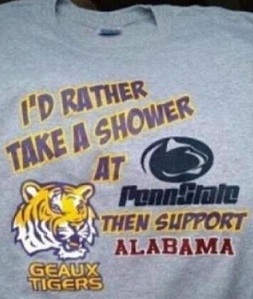 Apparently the creator of this shirt would like to take a shower at Penn State and “THEN” root for Alabama! I am not sure why they would want to do this, but it is LSU, so there is no telling. This entry was posted in LSU, Penn State, SEC, T-Shirt by Travis Normand. Bookmark the permalink.